The UK has one of the worst cancer survival rates in Europe – because of late diagnosis. 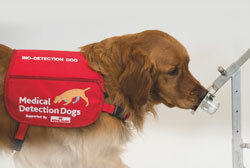 At Medical Detection Dogs we believe our research will help early diagnosis improve in the future. 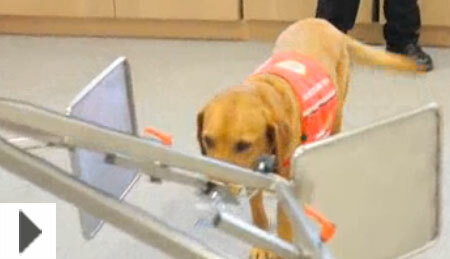 Medical Detection Dogs uses the amazing power of the dog’s nose to detect human diseases. 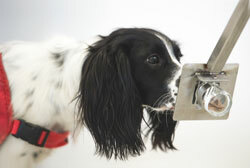 Our research is based on the dog’s ability to detect minute odour traces created by diseases. 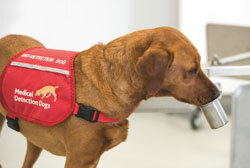 Because dogs are able to detect tiny odour concentrations, around one part per trillion (the equivalent of one teaspoon of sugar in two Olympic sized swimming pools), we are potentially able to detect diseases, such as cancer, much earlier than is currently possible. Our pioneering work could help to speed up the diagnosis process and impact on thousands of lives. To assist scientists through our research into the development of electronic systems (E noses) that will assist in the early detection of cancer through cheap non-invasive tests. In the short term, our cancer dogs could provide additional testing for cancers that are currently difficult to diagnose reliably, such as prostate cancer.